Directions: On this worksheet you will practice using the basic formulas and relationships for angular momentum. Question 1 A 37-gram point mass is traveling at a velocity of v = 2.8 m/sec parallel to the x-axis along the line y = 0.9 meters. What is its angular momentum with respect to the origin? Question 2 A whirligig, mounted on the top of a stake, is composed of metal biplane with a large spinning propellor. Initially the propellor has an angular momentum of 2.516 kg m2/sec. Later a blustery wind blowing for 2.8 seconds increases the propellor's angular momentum to 9.311 kg m2/sec. What average torque did the wind provide to the propellor? Question 3 One child, sitting on a tilt-n-spin with her arms held straight out at shoulder level, is pushed by second child. When the pushing stops, her initial rate of spin is 1.8 rad/sec. When she both brings her arms in so she can grasp the edge of the top wheel and also bends her head and shoulders over her crossed legs her rate of spin increases to 4.45 rad/sec. 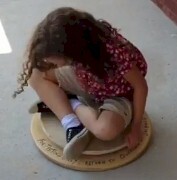 Find the ratio of the child's final moment of inertia to her initial moment of inertia. Question 4 A turntable with a moment of inertia of 7.28 x 10-3 kg m2/sec is initially turning at 331/3 rpm while it is playing the first record. A second record is stacked on the spindle and is ready to be dropped when the first LP finishes and the arm retracts. The second record has no initial rotation - it is at rest.The second record has a mass of 128 grams and a diameter of 30 cm. If you treat the second LP as a cylinder, what will be the instantaneous rotation rate of the turntable with both records when the second record lands on the first record? NOTE: this effect was actually noticeable as the turntable took a few milliseconds to get back up to speed after the second record was dropped on the top of the first record. Question 5 Kepler's 2nd Law of planetary motion states that 'a line from the planet to the sun sweeps out equal areas of space in equal intervals of time.' Today the proof of this law is based on the Law of Conservation of Angular Momentum and can be applied to any satellite, not just those of the planets. For example, any manmade satellite orbiting the earth will obey this law. In the figure below, let the mass of the satellite equals 2000 kg. When at position A the satellite is 8.19 x 106 meters from the Eath's center while at position B it is 1.79 x 107 meters from the center of the earth. If the satellite's speed at position B is 4.69 x 103 m/sec, then how fast is it moving through point A? Question 6 A group of physics students want to experience the 'thrill of the merry-go-round and conservation of angular momentum' so they go to a neighboring elementary school's playground. Notice in the first picture that they are each pushing on the merry-go-round tangentially to get the platform up to speed, 27.4 rpm. They then each 'hop on' facing the center. The moment of inertia of the merry-go-round is 2250 kg m2 and it has a radius of 1.58 meters while the mass of each student is approximately 70 kg. What is the final angular velocity when all four students have hopped onboard and are crouched on the rim as seen in the second picture? You may treat the students as point masses. If you watch the video you will see that when all four students later stand up and lean inward (some more successfully than others) that the merry-go-round's rate of rotation returns to a value very close to its original rate.